Seems like vidoe is getting bigger and bigger. I am considering to add a video category instead of having it hide under the Camera Hacks section. 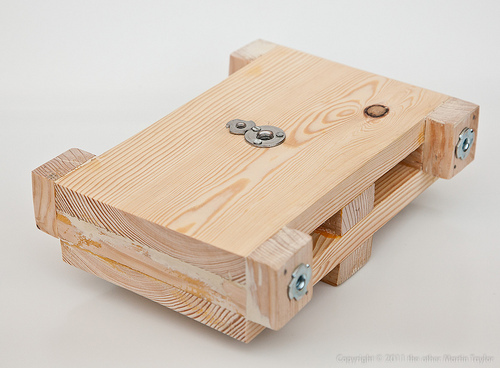 After the impressive table top dolly design, Martin Taylor shows how to build a Slider Dolly. 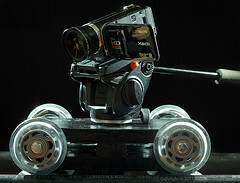 Sliders are popular because camera motions are shorthand for high production values but, because a slider unit is self-contained, setup times are significantly less than a full size camera dolly on rails. 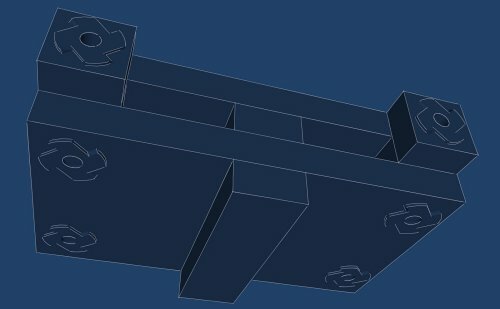 Not to be out done I wanted to be able to achieve these kind of shots sometimes but my need wasn’t severe enough to justify commercial prices so I went into CAD and then to my toolbox to come up with the following. 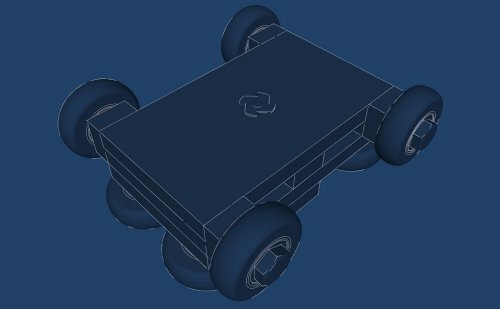 This is less a slider than a scaled down version of a floor mounted dolly and rails system. The truck isn’t captive so, unlike a slider, you can lift it off the rails. 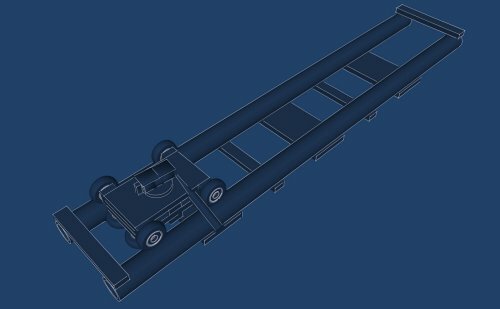 This makes it easy to transport and also allows you to create many different rails configurations for different situations that can utilize a single truck; the following tutorial offers one rail design but you can easily make longer rail systems that this truck can run on. Cut 2 x 9″ lengths from your 6×1″ board. 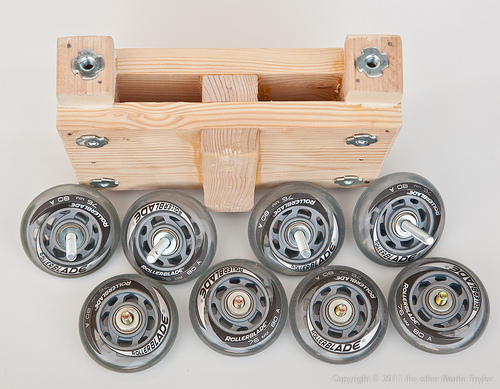 When solid drill 3″ long holes in the center of each axle block – they should be deep enough that they can accept the remaining threads of the axle bolts when they have the skate wheels in place. 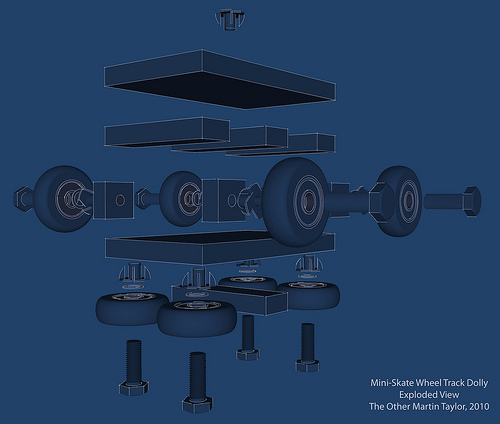 Mount the 4 main wheels: each has a long bolt, drop on the wheel, then a washer then screw into place – the wheel should be able to spin freely. Find and mark the center of the top of the truck body. This is where you will mount a t-nut of the correct thread (1/4″ or 3/8″) that your tripod head will mount to. You can see that I put both sizes of t-nuts on my truck so I can mount any tripod head on it. You can do the same or chose the thread you most commonly use. You can also use the smaller 1/4″ screw with an adapter to scale it up to 3/8″ when required. Mount the t-nut(s) as required. Take a 1/4″ or 3/8″ bolt appropriate for the t-nut(s) you just fitted and the tripod head you want to use. With a Dremel cut off wheel remove the bolt head. File your cut smooth so that it will easily mount in your t-nut and the base of your tripod head. You can cut a slot in one end of the screw to allow a flat screw driver to get purchase of your headless bolt if required. 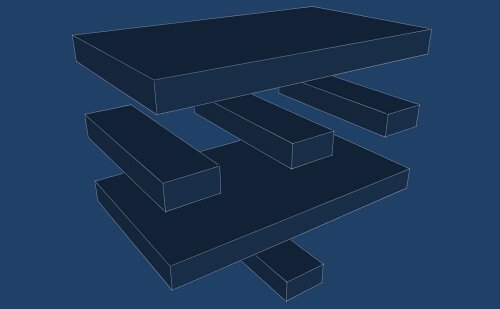 Cut 3 x 10.75″ sleepers from your 6×1″ board. Cut 4 x 10.75″ sleepers from your 2×1″ board. Mount the center 6″ wide sleeper to your rails first. 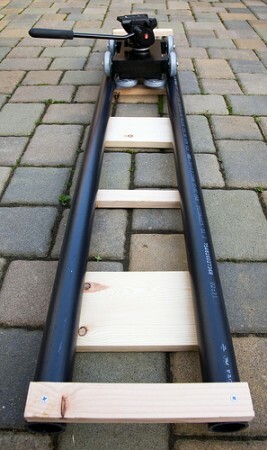 At the center of both rails, using the truck to accurately space the rails, drill a pilot hole and screw the sleeper to both rails – use 2 screws each side. 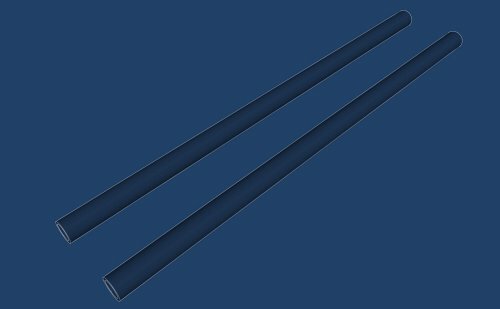 A wood screw should cut into the PVC pipe as well through the wood with ease. It helps to have a extra pair of hands when you’re trying to hold the rails the right distance apart and drill and mount the sleepers at the same time. Mount the two other 6″ wide sleepers about a third of the way down each rail in the same way, again using the truck to ensure the rails remain the right distance apart, screw the sleepers into place. 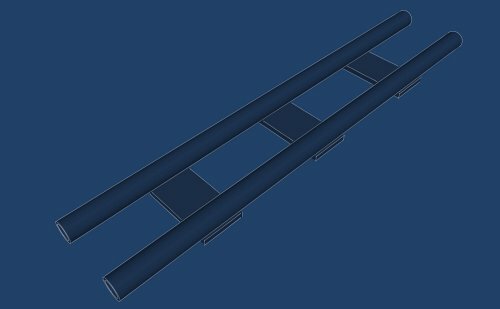 Mount 2 of your narrow sleepers between the 3 wide sleepers – these only need to be mounted with 1 screw per side. If everything works well you can take the tripod head and wheels off your truck and sand and paint it if you want. Everyone seems to like the truck better when it’s painted black even though it has little real practical purpose. You’re done and ready to roll! If you’re a SketchUp geek you can download and explore my construction model for this design. If you’re rolling into a focus point pre-focus with your camera in the final location and use a finger to mark where that position is on the rails – your finger makers a pretty soft stop point. Don’t use the end buffer of the rails as your stop point – the way the camera stops is too sudden. Start the movement slowly and end slowly – avoid sudden acceleration and braking. Don’t move the camera too quickly – you want to induce a feeling of sophistication not motion sickness. It’s really hard to move the camera consistently at a very slow speed. Pulling focus on a DSLR while rolling is very hard – avoid if at all possible. When you’re trying to get a smooth move you can hold the sled or head but it seemed to work best for me if I held the camera itself. 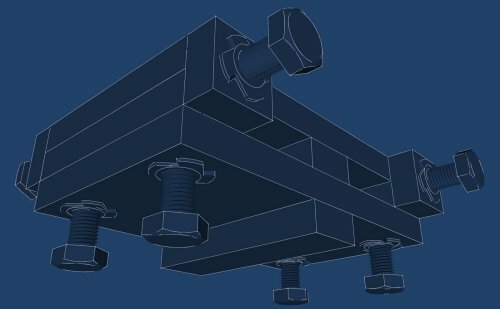 Keep your tracks, horizon and horizontal lines level – shim the tracks to achieve this and make sure they don’t rock part way through the move as the center of gravity changes. Again, these are just my personal findings. If you know better I’d love to hear from you. Ed note: This got me thinking that you can also use this as a rail for inexpensive time lapse movies, using a BBQ rotisserie or a Kitchen Timer as a pulling engine. Martin Taylor is a Lancashire lad who accidentally emigrated to San Francisco. SW engineer w/Eng Lit degree. Photog, Petrol-head, Sketchup fan, movie-hound, with guitar fetish. See his work Flickr, check his website and follow him on Twitter.